Who should decide who is college material and who isn’t? College, of course, isn’t for everybody, but who should decide — and how and when — which students should go and shouldn’t? In this post, Kevin Welner and Carol Burris ask whether the decision should be made by policy makers and school officials or parents and students after young people have had equitable opportunities to learn in elementary and secondary school. Welner is the director of the National Education Policy Center, located at the University of Colorado Boulder School of Education. He is the author of the 2008 book, “NeoVouchers: The Emergence of Tuition Tax Credits for Private Schooling.” Burris is the award-winning principal of South Side High School in New York. She was named New York’s 2013 High School Principal of the Year by the School Administrators Association of New York and the National Association of Secondary School Principals, and in 2010, tapped as the 2010 New York State Outstanding Educator by the School Administrators Association of New York State. Robin should become a printer. That’s what Robin Calitri’s school counselor told his dad in 1965. Robin thought his counselor’s advice was just swell. He wasn’t a motivated high school student. But his dad, who was a professor of English Literature at Hofstra University, made it clear to the counselor that his son was going to college. Robin later became the principal of Long Island’s South Side High School and was a finalist for the national principal of the year in 1999. He would tell that story about the counselor whenever he explained the harm done by tracking—the sorting of some students into classes that are not designed to prepare those children for post-secondary education. If his dad had gone along with the counselor’s recommendation, his son would likely have ended up in a trade that was becoming obsolete. To his credit, Robin understood that this was precisely the situation faced by children in working-class and poor families. Research on tracking and choice confirms this; working-class and poor families, as well as parents without a college education, are more deferential to the advice of school authorities and less willing to push back on the system. Robin also understood that a young person’s future hangs in the balance when school authorities are making rules that will cut off college as an option. Yes, we can all agree: college is not for everybody. But should school officials and top-down policy makers decide based, for example, on Common Core college readiness test scores, or should the decision be left to parents and students after schools have given them meaningful, enriching, equitable opportunities to learn? While college is not for everybody, opportunities to be prepared for college definitely should be. When college-educated parents have the capacity to secure the college advantage, they certainly seize it for their own children. It is not unusual, for example, to see upper middle class parents spend thousands on tutoring—including tutors for the SAT and the college essay. College-educated parents understand that a four-year diploma is key to securing financial success. The “we” who are the deciders is left somewhat undefined, but it’s safe to assume that the use of “we” does not give power and capacity to the students themselves. Perhaps we are unwise in working our tails off for our children to go to college. But unless and until we acknowledge this, we should be wary of sending other families down a different path. Mr. Petrilli and the governors are correct to the extent that they are simply acknowledging that not all children will go to college and that those who do not should nonetheless have opportunities to thrive. It is also true that the decision to forgo or delay college should be made before graduation day. From that point on, however, the “sort and select” advocates get almost everything wrong. Their fundamental two-part assumption is, first, that they can and should identify children who are beyond academic hope. Second, they believe that it is possible and beneficial to identify these children early, separate them from their academically oriented peers, and put them on a track that hopefully prepares them for post-secondary employment but does not prepare them for college. Equitable schools reject such tracking policies because they believe in the American Dream and because they have learned from past mistakes. History tells us that schools should not be in the business of foreclosing children’s options. At the start of the 20th century, schools faced an influx of immigrants, and policymakers responded by creating programs for those who were called the “great army of incapables.” Vocational tracks prepared immigrants to be factory workers, while the children of well-off parents were given a college preparatory education. This pattern of separating students into different classes was repeated during the era of racial desegregation as a way to maintain segregated classrooms—and then again in the 1970s when students with special needs were increasingly enrolled in mainstream schools. History and research show that when schools sort in this way, it is the disadvantaged children who are directed toward lower-tier tracks. No matter what criteria are used—scores, recommendations or even choice—the same patterns of stratification occur. Accordingly, when lawmakers adopt these misguided policies, they open up opportunity gaps that inevitably lead to the achievement gaps that these same lawmakers then decry. Mr. Petrilli concedes that he understands the danger. Describing the bad old days, he writes, “Those high school ‘tracks’ were immutable, and those who wound up in ‘voc-ed’ (or, at least as bad, the ‘general’ track) were those for whom secondary schooling, in society’s eyes, was mostly a custodial function.” Yet he turns back to voc-ed because, as he contends, the odds are otherwise too long for disadvantaged students. Beginning with the statistic that only 10 percent of these disadvantaged students earn a four-year degree, Mr. Petrilli asserts that if we work really hard as a society maybe this number would rise to 30 percent, which for Mr. Petrilli is not good enough. 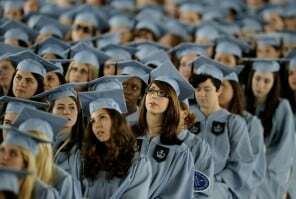 Since recent data show that 33.5 percent of Americans ages 25 to 29 have at least a bachelor’s degree, that sounds like a pretty good outcome to us. By the way, that’s the highest percentage ever for Americans, and it doesn’t include those who earn two-year degrees as well as certificates in our community colleges and post-secondary technical schools. The “You’re Not College Material” approach is the same one we use far too often in schools. Too many kids hear—You’re not ‘honors’ material, or Challenging science and math isn’t for you. And every time that strategy is used, we see the same results—classes that are stratified by social class and race. It’s an approach that reinforces existing inequalities. To say in a supposedly neutral way that not all students will go to college is disingenuous without first acknowledging something else: that what’s really being said is that we should accept that college is for the already advantaged. On some level, Mr. Petrilli grasps these concerns—when he acknowledges the past harms of tracking and that “when judgments were made on the basis of ZIP code or skin color, the old system was [deterministic, racist, and classist].” What he doesn’t acknowledge is that his new system would be the old system. It’s interesting to us that the Petrilli article’s argument relies in part on the German system of tiered schooling, where college-bound students head to the Gymnasium while vocation-bound students head to the Hauptschule or Realschule. Yes, it’s true that students attending the German vocational schools do better than voc-ed students here, in part because of a more equitable job sector following graduation. But a team of German psychologists recently published an article in The Journal of Educational Psychology on the effects of the German vocational track on the development of student intelligence—and they found that students in the academic track experienced substantial IQ gains as compared to those voc-ed students. Not only did the learning gap grow, so did the very capacity to learn between German academic and vocational students. That outcome should give us pause. Our quarrel is not with offering vocational opportunities in high schools. Rather, we favor a smart and fair approach that works for children and families who, at the right time and place, make the choice for a career after high school. We might, for example, retool our two-year colleges so that they offer more programs in technology and other marketable areas, without making students jump through remedial hoops to stay. We might also follow the lead of Finland and prepare students with a strong and equitable academic education without tracking until age 16, and then allow them to make meaningful career and life choices. We may even look at promising models, such as California’s Linked Learning schools, which integrate career preparation while still preparing students for college. High schools have an obligation to do their best to prepare students for college and career; preparation for both has more overlap than often assumed. We reject, however, No College for You! proposals that sort 14 year olds into vocational high schools. South Side High School, one of the best in the nation, would likely be a very different place if co-author Carol Burris’ predecessor, Robin Calitri, had obliged his counselor when he was told “Kid, you are not college material.” That counselor did not have the right to make that decision—and neither does Mike Petrilli. Comments Off on Who should decide who is college material and who isn’t?